As the perumal of this place gave the Thirupaarkadal and stands as Rama the greatest among the men so named as Purushothaman along with his wife Purushothama Naayaki - Periya piratti, this place is called as Thiru Vann Purushothamam. As Lord Narayana gave generously the Thirupaarkadal to Upamanyu Maharishi, the theertham is known as Thirupaarkadal Theertham. Sanjeevi Mooligai (An herb) saved Lord Rama itself. So inorder to indicate this, the Vimaanam of this place is named as Sanjeevi Vigraha Vimaanam. The term Purushothamam means the person who is best among Bhaktar, Muktar, Nitheyar and Purushar (ie) among Devotees, the person who had attained eternity, the soul of the human being always lives with the god. The Utsavar Purushotaman found in this sthalam is said to be so beautiful and can easily attract everyones attention and heart towards him. Access to the temple About west corner of the Thirunangoor's north Prakara. 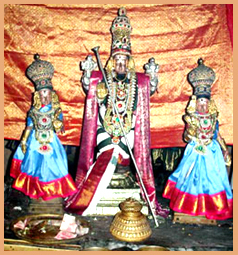 The Moolavar of this Divyadesam is Sri Purushotaman. The Moolavar is in the Nindra (Standing) Thirukkolam facing his thirumugham towards east direction. Prathyaksham for Upamanyu Maharishi. This temple lies in Thirunaangur of Tanjore district in Tamil Nadu. It's about 5 kms away from Seerkazhi. Bus facilities are also available.